How and when they do that is what attracts people with different interests to the hobby. Here are a few of the ways hams communicate. That is, "line of sight communications," usually limited to 14 miles or so because of the curvature of the earth. Repeaters receive a signal on one frequency and instantly re-transmit the signal on another frequency. Repeaters are usually located on "high ground" and many operate at higher power, so their signals reach farther. Most repeaters have at least a 30 mile range. The big advantage of a repeater is that you can be using a low-power transceiver (like a handitalkie) and, working through the repeater, communicate with other hams who would not otherwise be able to hear your signal. At many frequencies, radio waves "bounce" off the Ionosphere and are returned to earth. That's how hams can communicate over long distances without using repeaters. The "Ionosphere effect" varies during the day and is influenced directly by the sun. This effect fades rapidly after sunset. More than half of all ham radio contacts rely on this effect and this is how hams connect with other countries around the world. There are some (not many, though) amateur radio satellites in orbit (both low and in geosynchronous orbit) that permit earth-to-earth communications through the satellite. 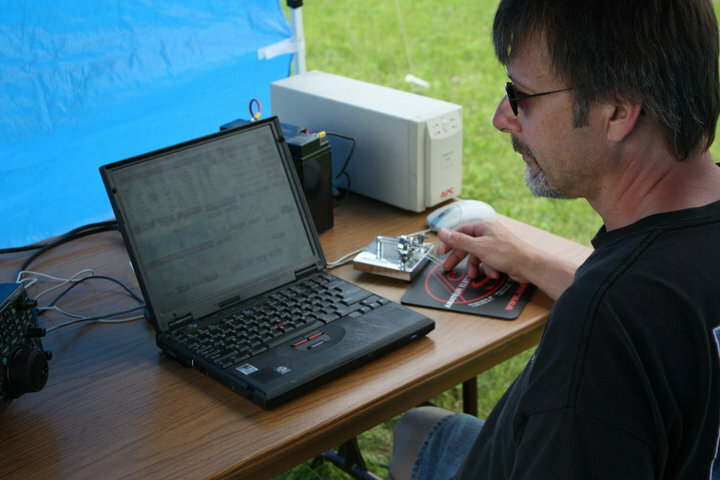 Using the Internet as a "Partial Path"
Some amateur radio repeaters are connected via the Internet and provide communications paths via a system called "EchoLink" that can allow a ham in Milwaukee, for example, to talk through a repeater in Toyko to a ham there. Really! Called EME - for Earth-Moon-Earth - communications, some hams use this technique and enjoy the challenge. A meteor shower has the same effect as sunlight on the Ionosphere and allows signals to bounce off the "trail" of a meteor shower at night. A rare occurrence, but an interesting technique. 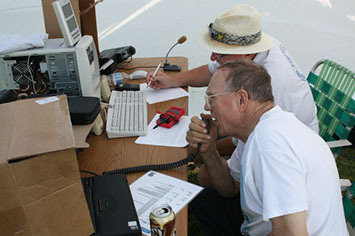 Amateur Radio Operators use different "modes" of communication, depending on their skills and "band conditions" at the time a contact is originated. Morse Code - the "dot-dash-dot" that you've heard about. A very effective mode of communication, especially when conditions are rough. A CW signal can "get through" when other modes cannot. There are different "voice modes" which include AM, SSB and FM. There are many different "digital modes" in use and more are being developed. In this mode a computer is used to generate the "signal" that is then transferred to the operator's radio and broadcast over the air. On the receiving end a modem translates the signal back to a pattern that the computer can understand and display as characters on a monitor. Yes, some amateur operators broadcast what are called "slow-scan TV signals" to other hams.